Late one afternoon we noticed a doe sniffing and lingering close to the creek that borders our backyard. Very odd behavior. She was watchful and it seemed as though she was looking for something. Off she bounded after about 10-15 minutes. Next day she was back. 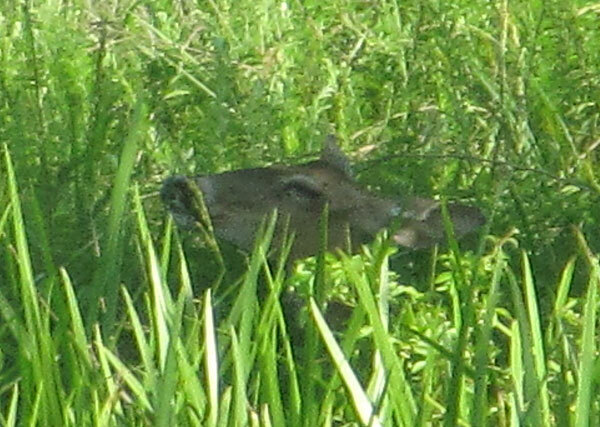 She took a good look in every direction then sank down in the high grass. I think she felt me watching. Didn't seem to bother her. That's when we became pretty sure she'd given birth, left her baby hidden there and was coming back to check her fawn and feed it. Usually fawns are left for about a week until they are strong enough to walk with and keep up with their mothers. Day after day she returned. Sometimes we saw her in the morning; sometimes in the late afternoon or early evening. 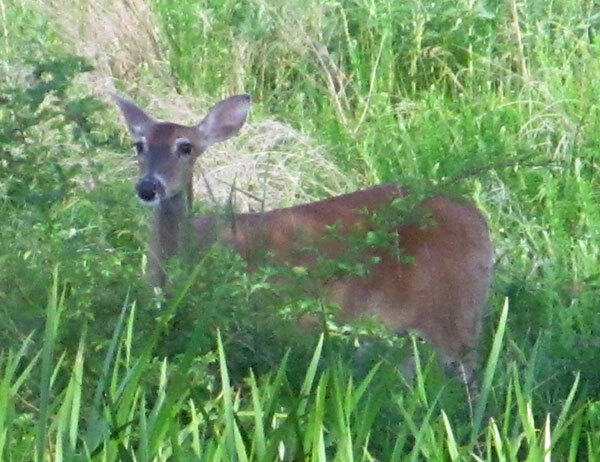 Was she one of the deer herd that comes to our place to graze and play? We suspect so. We know she certainly felt pretty safe. If she was one of that herd, she knew our horses would do not more than lift their heads to watch and that our dogs would not bother her either due to the yard fence. As you can imagine, we were itching to see the fawn. Finally, after 6 days, she returned to move her baby. They didn't go far. Just up the hill to a swag of even higher grass. It took the doe just a minute or two to settle in the fawn, then off mama went. 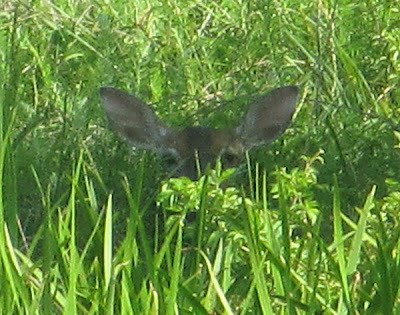 Since then we've seen the doe return twice. That spot is harder to see. By now she's probably taken the fawn and moved on. There's something magical about a wild animal trusting us so much. 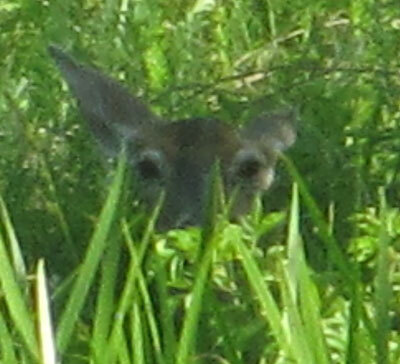 Even after she knew we'd spotted her, she didn't run away immediately or move her fawn. Fawns and their mothers generally stay together for about a year, so we're hoping to see this pair again. Ah, the joys of country life! Ohhhhh how exciting and ohhhhhhhh sooooooooo sweet!!! The Mama knew she had a safe haven! Can't wait for updates!